The two different types of laughter are spontaneous and non-spontaneous. Spontaneous includes natural laughter because you perceive something funny. It challenges the belief that we are in full control of our behavior. (If you see someone hysterically laughing, you often begin laughing with them.) Non-spontaneous laughter includes fake laughter, forced laughter, and nervous laughter that is unconnected to humor. Some psychologists argue that non-spontaneous laughter includes the diabolical laugh of a serial killer, and the cruel laughter of a bully. Laughter has a dark side as well. When gangs or groups of soldiers attack someone, they often laugh because they feel pleasure/satisfaction in causing someone pain. The Joker is a good example of laughter's dark side. Spontaneous and non-spontaneous laughter have different origins in the brain. Spontaneous laughter originates from the brain stem, an ancient part of the brain. It is the more original form of laughter. Non-spontaneous laughter comes from other parts of the brain that have developed recently due to evolution/technological advances in human society. Anatomy-wise, laughter is caused by the epiglottis constricting the larynx. This manipulates the pitch and volume. (commonly known as the voice box.) The epiglottis is a soft piece of cartilage that flips down to cover the voice box when you swallow. The study of humor and laughter, and its psychological and physiological effects on the human body, is called gelotology. Neurophysiology, the study of the nervous system function, indicates that laughter is linked with the activation of the ventromedial prefontal cortex, which produces endorphins (hormones) and are associated with pure emotion regulation. Endorphins triggered by laughter not only relieve the pain of accident or illness, but they can actually enhance the healing process by helping us develop greater optimism and joy. The vertormedial prefrontal cortex is located in the frontal lobe of the brain and is in charge of processing fear, risk, and decision making. Neural networks in the ventromedial prefrontal cortex quickly develop during adolescence and young adulthood, supporting emotion regulation through the amyglada. The left side of the prefrontal cortex is highly active during guessing tasks, while the right side is associated with regulating reasoning and responses. Scientists have shown that parts of the limbic system are involved in laughter. This system supports a variety of functions including emotion, behavior, long term memory, and sense of smell. It is also highly connected with the nucleus accumbens, or the brain's pleasure center, which plays a roll in sexual arousal and the "high" you get from recreational drugs. 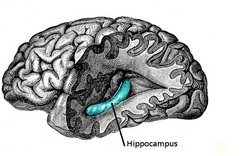 The Hippocampus is a major component of the brains of humans and other mammals. It is located inside the medial temporal lobe. It plays important roles in the putting together of information from short-term memory to long-term memory and spatial navigation. It sends memories out to the appropriate part of the cerebral hemisphere for long-term storage and retrieves them when necessary. Often called a seahorse in English, this neurostructure is a representation of an Ancient Greek mythological creature. It has the shape of the folded back forelimbs and webbed feet of the classical hippocampus, a sea monster with forelegs of a horse and the tail of a fish. 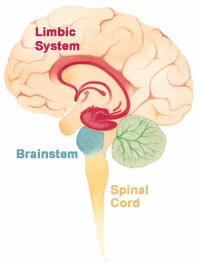 It is a paired structure, with mirror-image halves in the left and right sides of the brain. In Alzheimer's disease, the hippocampus is one of the first regions of the brain to suffer damage; memory problems and disorientation are among the first symptoms. Damage to the hippocampus can also result from oyxygen starvation (hypoxia) or medial temporal lobe epilepsy (seizure.) People with extensive hippocamal damage may experience anterograde amneisia - the inability to form or retain new memories. 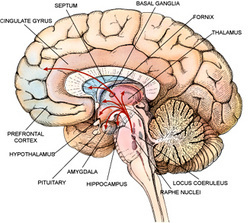 The Amygdala is responsible for determining what memories are stored and where the memories are stored in the brain. It is believed that this determination is based on how big of an emotional impact the event has on the person. It is also responsible for arousal, autonomic responses associated with fear, emotional responses, and hormonal secretion.